UNIVERSITY HEIGHTS, Ohio – The National Council for History Education (NCHE) has announced this year’s winner of the Paul A. Gagnon Prize, which is given to an individual or group who has made a significant contribution to history education. 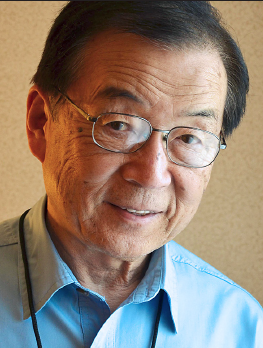 Sam Mihara received the award for his work lecturing about his imprisonment as a child at Heart Mountain camp during World War II. Mihara was inspired to start speaking about his experiences after the 2011 opening of the Heart Mountain Interpretive Center at the site of his childhood incarceration. Along with his busy lecture schedule, he has been an active member on the board of the Heart Mountain Wyoming Foundation over the last few years. In the last five years, Mihara has spoken to over 50,000 students and teachers throughout the U.S. In his “Memories of Heart Mountain” presentation, he discusses the experiences of the Japanese Americans who were imprisoned and how the lessons learned from this bleak period in the country’s history apply to help solve today’s issues. The prize was the result of a competition looking at entries from the roughly 100,000 history teachers throughout the country who teach over 20 million students of history. Mihara is the first Japanese American to receive the award. The award ceremony will be held on April 20 in San Antonio, Texas, at this year’s national NCHE conference. For more information about NCHE and the Paul A. Gagnon Prize, visit www.nche.net. Schools and organizations interested in hearing Mihara’s presentation may contact him at his website: www.sammihara.com . Heart Mountain Interpretive Center tells the story of some 14,000 Japanese Americans unjustly incarcerated in Wyoming from 1942 through 1945. The center is located between Cody and Powell on Highway 14A. Museum admission is $7 for adults and $5 for students and seniors. Children under 12 and members of the Heart Mountain Wyoming Foundation are free. For more information please call (307) 754-8000 or visit www.heartmountain.org. After retirement from the Boeing Company as a rocket scientist, Mihara was enjoying his free time, traveling and fishing around the world. In 2011, he received a call from the Heart Mountain Wyoming Foundation: they had received a request from the Department of Justice (DOJ) to have a former resident of the prison camp give a talk at a conference. Quickly putting together a story with both family photos and professional images (taken by Dorothea Lange and others), a presentation was born. After the success of this event, he was referred to many other DOJ offices. After that, the referrals snowballed, reaching other groups including schools, universities and government offices. Meanwhile, Mihara kept improving on the presentation, adding references and analyses of an array of events such as Executive Order 9066, the Supreme Court cases of Fred Korematsu and Mitsuye Endo, and video recordings of other incarcerees’ testimonies. That growth kept increasing to the point where, in 2017, Mihara reached over 12,000 students, teachers and attorneys throughout the country. The main venues for his visiting lectures are UCLA, UC Berkeley, and Harvard. However, the backlog extends to many venues throughout the country with bookings already made into 2019. He donates all of his speaking fees to support the HMWF. Mihara has also been studying the conditions at the current detention facilities for undocumented Latino mothers and children, along with the proposed registration of Muslim Americans. In the latest iteration of his presentation, he is exploring ways to apply the lessons learned from the World War II camps to these current issues.